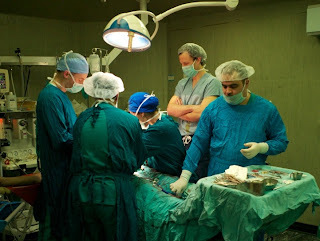 Through the generous sponsorship provided by Verathon, Dr. Judith Hagedorn traveled to Hebron, West Bank with mentor Dr. Scott Eggener to learn and assist surgeries at Hebron Hospital. Although in a politically turmoiled area, Dr. Hagedorn was able to develop an understanding of the diversities in healthcare due to limited resources. “Every morning we got picked up with the Ambulance of the Hebron Hospital. Our Palestinian driver made a daily pit stop, either to get some strong Arabic coffee or freshly fried falafels. their appreciation for our visit. In addition, the patients were overly thankful and there was never a day we didn’t leave the hospital without a small present from one of the patients’ families. Interested in learning more about our resident scholar program? Find more information at our website, www.ivumed.org.